*Survey of 40,000 people by Kantar TNS. We are all about our ancient grains. That's why we added sprouted grain quinoa to brown rice to make our new bite-sized rice cakes. 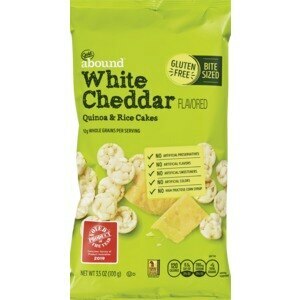 And when we mixed in some zesty cheddar cheese flavor, they became a tasty sensation we just had to share. These crunchy little treats are whole grain, gluten free, and contain little cholesterol, making them one of our favorite savory snacks. At Gold Emblem abound®, we believe a healthy life should be a tasty life. That's why we carefully source nutritious ingredients that satisfy your cravings, but never give up great taste. We make choosing nourishing snacks simple. Because with us, wholesome choices abound. We're Gold Emblem: Our standard is delicious. We guarantee you'll love this item or your money back.